Follow-up question: why is the derivative quantity in the student's savings account example expressed as a negative number? What would a positive [dS/dt] represent in real life? Challenge question: describe actual circuits you could build to demonstrate each of these equations, so that others could see what it means for one variable's rate-of-change over time to affect another variable. A very important aspect of this question is the discussion it will engender between you and your students regarding the relationship between rates of change in the three equations given in the answer. It is very important to your students' comprehension of this concept to be able to verbally describe how the derivative works in each of these formulae. You may want to have them phrase their responses in realistic terms, as if they were describing how to set up an illustrative experiment for a classroom demonstration. 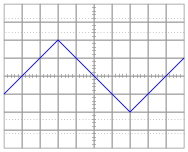 Note: the amplitude of your current plots is arbitrary. 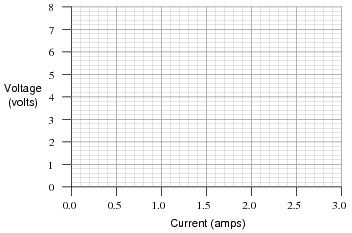 What I'm interested in here is the shape of each current waveform! 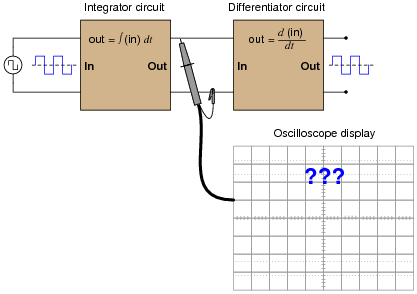 Follow-up question: what electronic device could perform the function of a "current-to-voltage converter" so we could use an oscilloscope to measure capacitor current? Be as specific as you can in your answer. As the robotic arm rotates up and down, the potentiometer wire moves along the resistive strip inside, producing a voltage directly proportional to the arm's position. A voltmeter connected between the potentiometer wiper and ground will then indicate arm position. A computer with an analog input port connected to the same points will be able to measure, record, and (if also connected to the arm's motor drive circuits) control the arm's position. 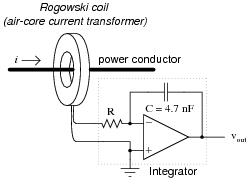 If we connect the potentiometer's output to a differentiator circuit, we will obtain another signal representing something else about the robotic arm's action. 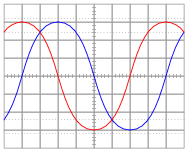 What physical variable does the differentiator output signal represent? This question asks students to relate the concept of time-differentiation to physical motion, as well as giving them a very practical example of how a passive differentiator circuit could be used. 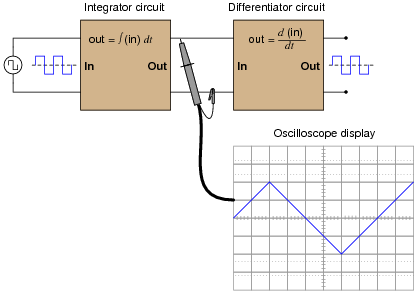 In reality, one must be very careful to use differentiator circuits for real-world signals because differentiators tend to amplify high-frequency noise. Since real-world signals are often "noisy," this leads to a lot of noise in the differentiated signals. 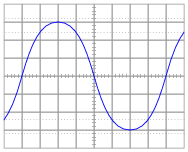 In a capacitance, voltage is the time-integral of current. 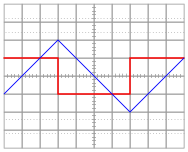 That is, the applied current "through" the capacitor dictates the rate-of-change of voltage across the capacitor over time. 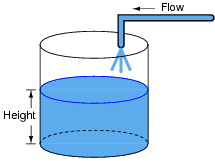 Challenge question: can you think of a way we could exploit the similarity of capacitive voltage/current integration to simulate the behavior of a water tank's filling, or any other physical process described by the same mathematical relationship? Hopefully, the challenge question will stir your students' imaginations, as they realize the usefulness of electrical components as analogues for other types of physical systems. However, since these are actually first-order "lag" and "lead" networks rather than true integration and differentiation stages, respectively, a DC bias applied to the input will not be faithfully reproduced on the output. 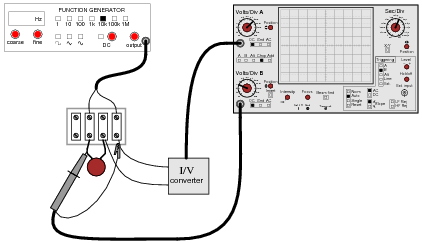 Whereas a true integrator would take a DC bias input and produce an output with a linearly ramping bias, a passive integrator will assume an output bias equal to the input bias.f Therefore, the subsequent differentiation stage, perfect or not, has no slope to differentiate, and thus there will be no DC bias on the output. 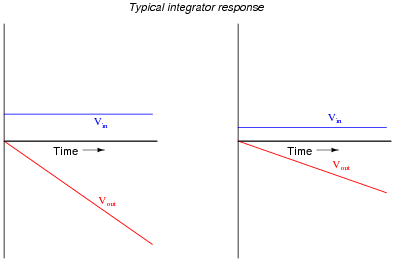 f If this is not apparent to you, I suggest performing Superposition analysis on a passive integrator (consider AC, then consider DC separately), and verify that VDC(out) = VDC(in). A passive differentiator circuit would have to possess an infinite time constant (t = �) in order to generate this ramping output bias! Students need to become comfortable with graphs, and creating their own simple graphs is an excellent way to develop this understanding. A graphical representation of the Ohm's Law function allows students another "view" of the concept, allowing them to more easily understand more advanced concepts such as negative resistance. I have found it a good habit to ßneak" mathematical concepts into physical science courses whenever possible. For so many people, math is an abstract and confusing subject, which may be understood only in the context of real-life application. The studies of electricity and electronics are rich in mathematical context, so exploit it whenever possible! Your students will greatly benefit. What significance is there in the use of lower-case variables for current (i) and voltage (e)? Also, what does the expression [de/dt] mean? Note: in case you think that the d's are variables, and should cancel out in this fraction, think again: this is no ordinary quotient! The d letters represent a calculus concept known as a differential, and a quotient of two d terms is called a derivative. Follow-up question: manipulate this equation to solve for the other two variables ([de/dt] = � ; C = �). Even if your students are not ready to explore calculus, it is still a good idea to discuss how the relationship between current and voltage for a capacitance involves time. 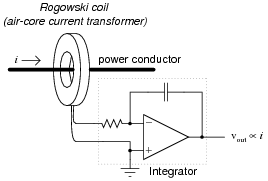 This is a radical departure from the time-independent nature of resistors, and of Ohm's Law! 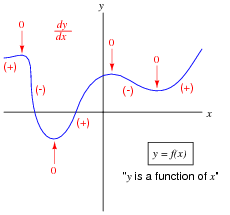 The graphical interpretation of "derivative" means the slope of the function at any given point. 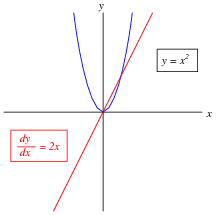 Usually students find the concept of the derivative easiest to understand in graphical form: being the slope of the graph. This is true whether or not the independent variable is time (an important point given that most ïntuitive" examples of the derivative are time-based!). 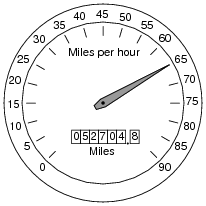 The goal of this question is to get students thinking in terms of derivative and integral every time they look at their car's speedometer/odometer, and ultimately to grasp the nature of these two calculus operations in terms they are already familiar with. 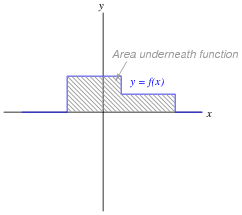 The graphical interpretation of ïntegral" means the area accumulated underneath the function for a given domain. Usually students find the concept of the integral a bit harder to grasp than the concept of the derivative, even when interpreted in graphical form. 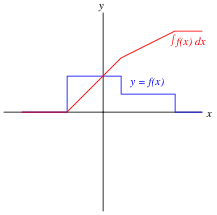 One way to help them make this "leap" is to remind them that integration and differentiation are inverse functions, then ask them to analyze the answer "backwards" (looking at the red integral plot and seeing how the blue function is the derivative of the red function). The thought process is analogous to explaining logarithms to students for the very first time: when we take the logarithm of a number, we are figuring out what power we would have to raise the base to get that number (e.g. log1000 = 3 ; 103 = 1000). 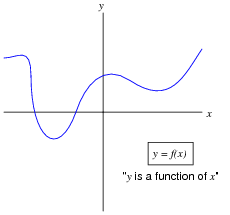 When we determine the integral of a function, we are figuring out what other function, when differentiated, would result in the given function. This is the essence of what we mean by inverse functions, and it is an important concept in algebra, trigonometry, and calculus alike. 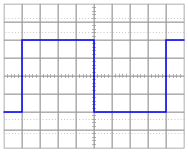 A forward-biased PN semiconductor junction does not possess a "resistance" in the same manner as a resistor or a length of wire. Any attempt at applying Ohm's Law to a diode, then, is doomed from the start. f It is perfectly accurate to say that differentiation undoes integration, so that [d/dt] �x dt = x, but to say that integration undoes differentiation is not entirely true because indefinite integration always leaves a constant C that may very well be non-zero, so that �[dx/dt] dt = x + C rather than simply being x. The "derivative" is how rates of change are symbolically expressed in mathematical equations. For example, if the variable S represents the amount of money in the student's savings account and t represents time, the rate of change of dollars over time (the time-derivative of the student's account balance) would be written as [dS/dt]. The process of calculating this rate of change from a record of the account balance over time, or from an equation describing the balance over time, is called differentiation. Hint: the process of calculating a variable's value from rates of change is called integration in calculus. 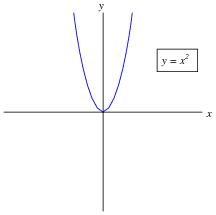 It is the opposite (inverse) function of differentiation. To integrate the [dS/dt] values shown on the Credit Union's statement so as to arrive at values for S, we must either repeatedly add or subtract the days' rate-of-change figures, beginning with a starting balance. Thus, integration is fundamentally a process of multiplication. 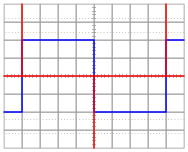 Some students may ask why the differential notation [dS/dt] is used rather than the difference notation [(DS)/(Dt)] in this example, since the rates of change are always calculated by subtraction of two data points (thus implying a D). 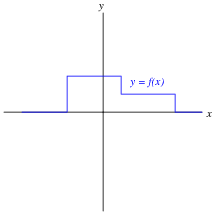 Given that the function here is piecewise and not continuous, one could argue that it is not differentiable at the points of interest. My purpose in using differential notation is to familiarize students with the concept of the derivative in the context of something they can easily relate to, even if the particular details of the application suggest a more correct notation.